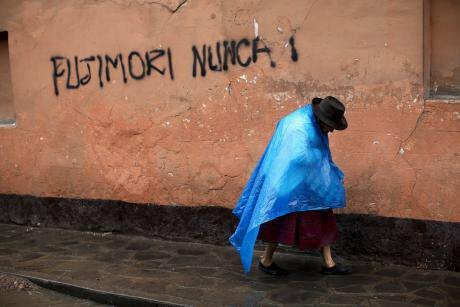 A Quechua woman walks by a graffitied wall in Ayacucho, Peru. April 2011. AP Photo/Rodrigo ABD. All Rights Reserved. In Peru, there is no left-wing political option representing the demand for greater distribution and inclusion. The weakness of the left there contradicted the region’s "turn to the left" in the decade of 2000. In Argentina, Bolivia, Brazil, Ecuador, leftist forces took advantage of the voters' discontent with the neoliberal policies of the 1990s to sail into government. They were able to benefit from a commodity boom to fund redistributive policies, which helped them expand their constituency. But even in the worst case scenarios, the left still shows signs of being an alternative force and a viable electoral option in these countries. This does not happen in Peru however. The consequences of the absence of the left in any country are significant. Steven Levitsky argues that leftist governments tend to implement redistributive and socially inclusive policies which result in the gaps between the population and the government decreasing, thus strengthening democracy. In addition, the extent to which the left can carry out its representative function through a party organization (more or less formally established) helps to prevent the emergence of populism and political instability. The absence of this sort of representation in Peru has led to the channeling of the demands for the redistribution of income from the commodity boom through a conflictive, chaotic and fragmented process, which has produced no major social results locally. In 2012, when budget transfers to local governments on account of natural resource extraction peaked at about 5000 million soles, the conflicts linked to the exploitation of these resources also peaked, with some 130 conflicts registered throughout the country. Growth without adequate income distribution has characterized the so-called "Peruvian miracle". This is not to say that building a new left in Peru is something that has not been repeatedly attempted. Several projects have in fact emerged throughout history: the Socialist Party of legendary Javier Diez Canseco; the Social Force, led by Susana Villarán, who became mayor of Lima for a short and turbulent period; Land and Freedom, which grouped environmentalists opposing the expansion of extractive industries; Gregorio Santos's rural-based Movement of Social Affirmation (MAS); and, finally, the Broad Front, which became the country's third political force at the last general elections in 2016 led by a new, young leadership. On the other hand, the Peruvian Nationalist Party reached the presidency with Ollanta Humala (2011-2016), but his leftist identity has been questioned. Humala gained a following by running as a leftist nationalist leader, but his government was in practice a conservative one. None of the aforementioned leftist forces has managed to establish itself as an electorally viable option in Peru. The radicalism and violence of the 1980s and 1990s overshadowed, and still overshadows, the electoral prospects of the left in Peru. For reasons that would be tricky to summarize, the Peruvian left was quite late in adopting democratic methods of doing politics. When it finally did, at the 1980 presidential elections, and when, two years later, it achieved its largest ever electoral support base and won the mayor post of Lima, a small radical group had already decided to carry out an armed struggle. The Shining Path (SL) and the Túpac Amaru Revolutionary Movement (MRTA) started a bloody armed conflict that left an estimated 70,000 casualties, millions of victims, and a rampant political and economic crisis. At the beginning of the armed conflict, the forces of the left as a whole had not yet updated their discourse, which was still radically Marxist and quite contradictory with the democratic ambitions of the United Left, their electoral political front. Every leftist idea - of redistribution, social rights or a greater role of the State in society - was demonized as an expression of radical, failed and above all violent ideology. So, the left was easy prey for the repressive smear policies deployed by Fujimorismo in the 1990s. Every leftist idea - of redistribution, social rights or a greater role of the State in society - was demonized as an expression of radical, failed and above all violent ideology. Thus, chaos and political violence interacted with the crisis of the United Left and the social movements that went with it. The Lima conservatism that emerged in the 1990s as a result of the violence and the economic crisis of the previous decade is one of the main obstacles that prevent the left from growing electorally in Peru. In the early 1980s, the Peruvian left began to score some successes among popular sectors with many social demands. But success in the cities, which helped the left in other countries to show that it could govern and to gather sufficient voter support to be entrusted with the task of forming a government, was curtailed in Peru in the 1980s. Lima, a city of almost nine million, became quite conservative and reactive to the radical past of the leftist forces. From then on, the left in Peru has constantly had to face effective attacks from the right, which accuses it of being radical, violent and against the system every time it sees it rallying increased popular support. Ollanta Humala gathered votes in the 2016 elections with a leftist discourse until he arrived to Lima. And he nearly lost the second round of the elections against Alan García who, despite being responsible for the economic disaster of the late 1980s, was running on a centrist program. The last general elections in 2016 have shown that there are still a substantial number of voters in Peru, particularly in the South, who lean preferably to the left. The southern regions were decisive, for example, in the second round of the 2011 elections, by giving a majority of votes to Ollanta Humala’s Nationalist Party. In 2016, they boosted support for the Broad Front’s candidate, Verónica Mendoza, from an initial 1% to 20% at the end of the first round of the elections. This, however, has not been enough to ensure success in expanding voter support and winning national elections. The left has to make concessions to the center-right so as not to be swept away by Lima's conservatism. These concessions imply, as in the case of the Ollanta Humala and Susana Villarán’s governments, ruling out any major changes in the established economic model, based on exporting natural resources, to the detriment of social redistribution proposals and the recommencement of the role of the State in the economy. Ollanta Humala won the first round of the elections in 2006 with 30% of the votes. His discourse, which terrified Lima, was that of the “great transformation". Most of his voters came from the poorest provinces of the Andean south and the Amazon, the seven regions with the lowest Human Development Index. He also gathered votes in the regions where mining and hydrocarbon transnational corporations have expanded their operations, generating high redistributive expectations but also nationalist sentiment. In the second round, he lost to Alan García who ran a demonizing campaign in which the right used Humala's link to Hugo Chávez to discredit him. In 2011, Humala had learned his lesson. In order to win the second time round, he needed to lean towards the center-right. This he did even before the second round, by switching from the "great transformation" to a new "road map" which managed to convince key political figures opposing a return of Fujimorism, but who hoped that Humala would not change the foundations of the neoliberal growth-model, to join him. The decisive turn to the center-right happened during the first year of Humala's government. Popular opposition to a gold mining project in Cajamarca led to the resignation of Humala's progressive cabinet, which was replaced by a new one advocating economic continuity and a strong hand to face social protests. The most daring measure that Humala’s government carried out was a reform of the social programs against poverty aimed at alleviating the effects of economic growth through some redistributive efforts. He created the Ministry of Development and Social Inclusion (MIDIS), technically-led and comparatively free from temptations of cronyism. In the context of economic growth, the economic assistance programs (conditional cash transfers) had more impact than the nutritional ones and those aiming at social organization and/or the structuring of local production. The case of Susana Villarán, who landed in Lima’s mayor office after the 2010 elections backed by a small and inexperienced party, Social Force, is worth noting. The inexperience of Villarán and her team led her to make an erroneous reading of her victory, which occurred by a tiny margin and benefited from an accidental and weak support, after one of the favorite candidates was left out of the elections for administrative reasons. Martín and Paolo Sosa believe that Villarán thought that she had the necessary political strength to radically change the style of government of her predecessor, who had prevailed in Lima thanks to large and visible infrastructure projects. The opposition by conservative sectors in the media, the church, the Peruvian Aprista Party and her predecessor, Luis Castañeda, became a persistent hindrance to Villarán’s municipal government, which finished its tenure huffing and puffing, with more than half of his municipal council revoked. The "inconsistency” between the discourse on the one hand, and the public policies and the (programmatic) positions which "converge" to a large extent with those of other parties within the system on the other hand, prevents the branding of political parties. The formation of a viable left-wing political force seems impossible in Peru. According to Noam Lupu, the "inconsistency” between the discourse on the one hand, and the public policies and the (programmatic) positions which "converge" to a large extent with those of other parties within the system on the other hand, prevents the branding of political parties. When the political forces face one or the other of these problems, the Peruvian left faces both of them at the same time. The need for a turn to the right forces it to constantly alter its discourse, generating uncertainty among its support bases regarding its position, distrust regarding its promises, and conflicts and ruptures with the most radical groups who do not feel represented by these changes. On the other hand, by converging with the position of other forces, the left cannot effectively differentiate itself from them or offer voters a clear alternative. In short, in Peru, the shadow of radicalism leads the left to constantly face a very complex and awkward situation in relation to its ideological standing. The conservatism of Lima’s voters is seemingly unbreakable and the left is apparently unable to learn how to move within the very thin line drawn out for them. Peru is probably the most emblematic case of democracy with weak political parties. The Left, much like other political forces, has not sought to build a party organization with territorial and an internal structure which would have granted greater stability when in government. The reasons have not to be found exclusively on the left. Alberto Vergara and Daniel Encinas note that in Peru, in light of the weakness of the political class, the legitimacy of the technocrats and bureaucrats who have emerged and settled in the State structures in the last two decades has been consolidated. Their power is based on the fact that they are the ones who guarantee "the Peruvian economic miracle". Governments like Humala’s, which have turned to the center-right, have adopted the pragmatic attitude of governing with these technocrats instead of building their own cadres and organizations. The continuity of the Ministers of Economy and Finance, and their positioning on economic policy shows the strength of this technocracy and the neoliberal model it advocates, as opposed to the weakness of a political class with no parties. On the other hand, the left in Peru in the 1990s did not count on an organized civil society on the basis of which constructing political organization could be carried out. In recent years, even though dynamics of social conflict have been generated in relation to the economic resource-exporting model throughout the country, the conflict has taken the form of an archipelago of fragmented demands which have failed to consolidate larger and more lasting social movements – unlike in other countries, such as Bolivia and Brazil, where these movements have helped to structure left-wing political organizations. In short, the left does not seem to have many ideas that would help it to create an effective government alternative to represent demands for redistribution and equity in Peru. The effort to do so requires learning, and inventing a way to move forward over a very thin tightrope that stretches between the need for major reforms and the persistence of conservatism.